I am a freelance writer living in Manly. I enjoy writing reviews for Weekend Notes. I enjoy the outdoors and anything to do with the water. My interests are travel, Live Theatre,The Ballet and Restaurants that serve delicious innovative food. 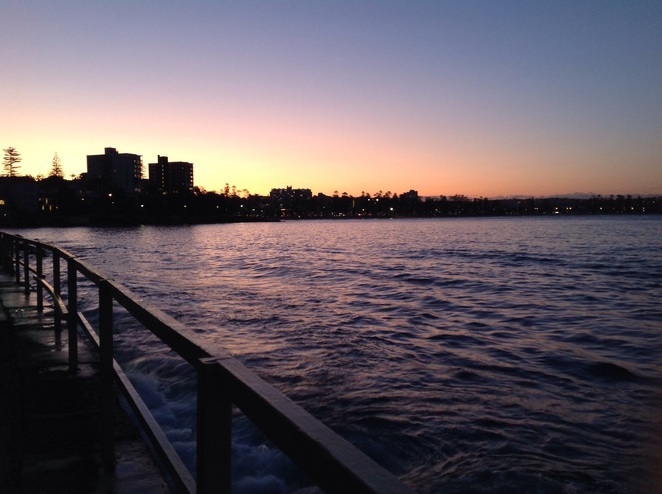 I often take a walk in the twilight along the beaches that Manly has to offer in the early evening. I thought I might share some of the beauty, so that others may do the same. I started this walk about 5.30 pm at the fairy Bower end of Addison rd. 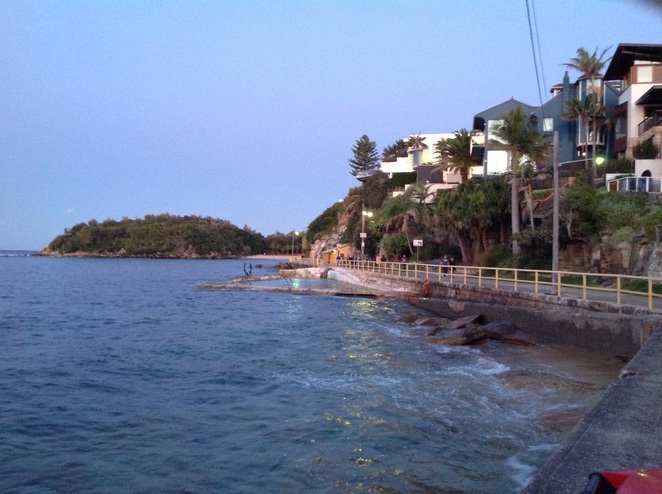 I walked down through the grassy walkway that leads to Bower St, then on to Shelly Beach. At this time of the evening there was still a lot of light in the sky with a touch of pink showing prettily on the horizon. As the sun went down, there was a lovely contrast of colour on the water and in the sky. 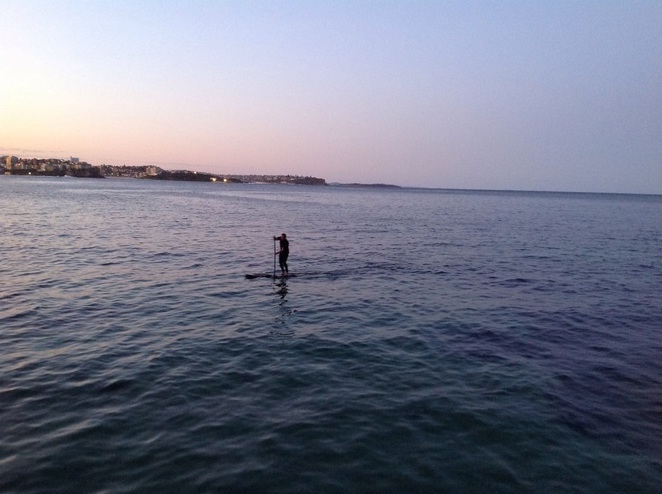 I spotted a man on a paddle board making for shore before dark. 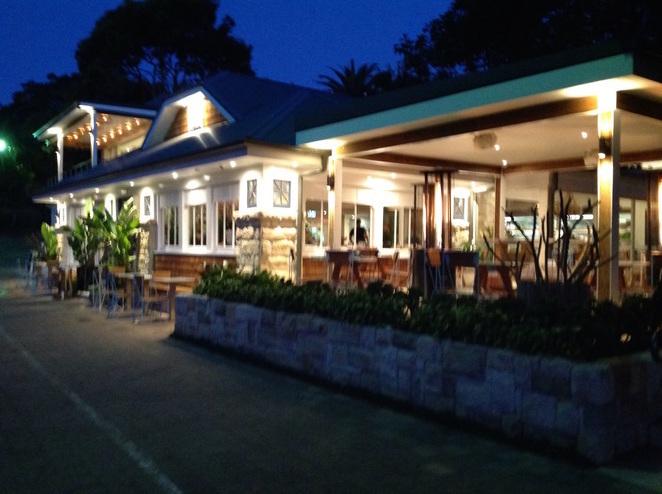 When you continue on this walk you will come to the Boathouse restaurant at Shelly Beach which has recently opened. You can go to the bar for a drink or stop to enjoy a meal. This lovely restaurant opens for brekfast and lunch every day and most nights for dinner. The Boathouse Restaurant, Shelly Beach Manly at night. 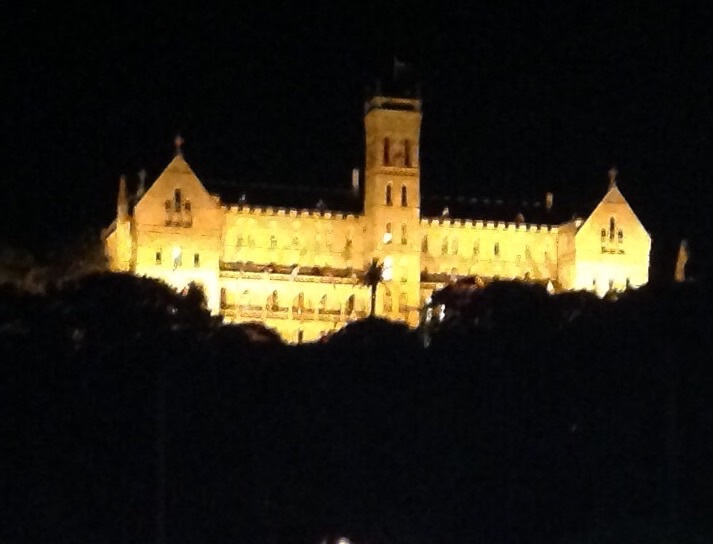 On the walk to Shelly Beach the lights of Manly are on show, so it's good to stop for a while and look back. As you make your way back towards Manly, follow the path right around to the main beach, and enjoy the view of the ocean. Here you will find lots of restaurants and cafes along the beachfront. There are plenty to choose from if you feel like a meal or a snack. Next make your way from the main beach along Wentworth st toward the Harbour. Here you can enjoy the lights of Manly Wharf. 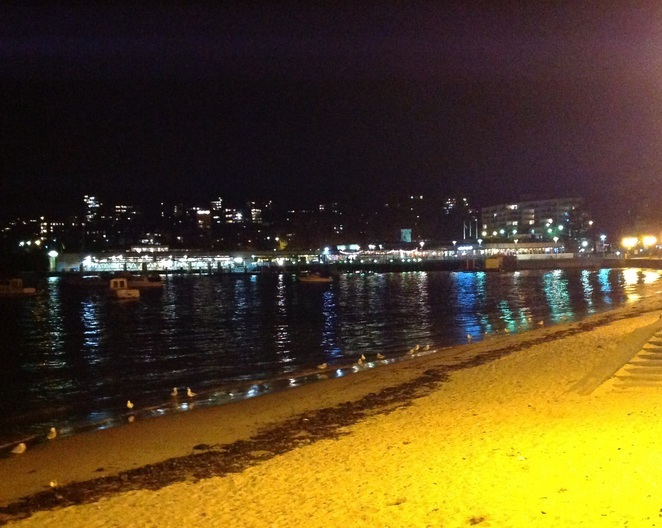 If you linger a little, you will see the lights of the Manly Ferry coming into Manly Wharf. I have seen this sight many times and it is always a delight. If you take a stroll along the promenade to Manly Wharf you may choose to enjoy a drink at the Manly Hotel. Maybe you could indulge in having a meal at Hugo's restaurant or a hot chocolate at the Max Brenner cafe. 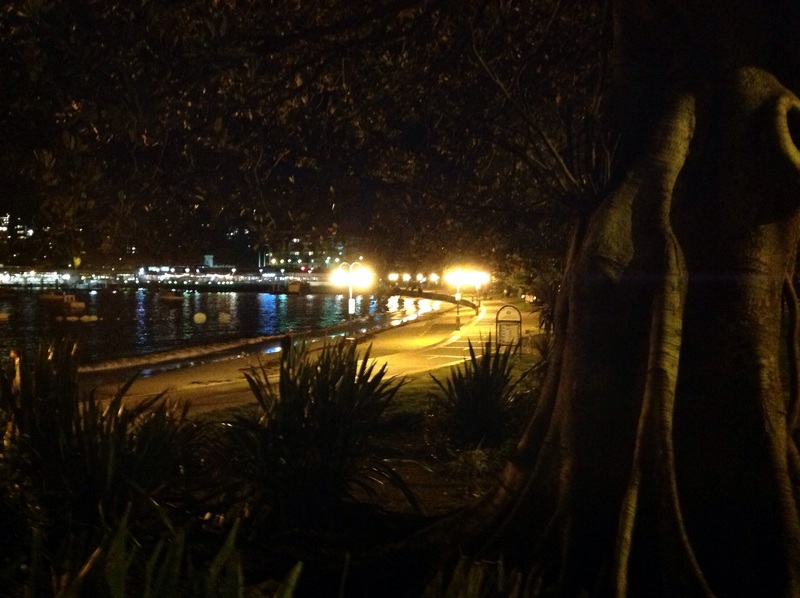 A scenic view of East Esplanade with the lights of Manly Wharf close by. After all this, if you have time, you could take a Ferry ride to Circular Quay and explore the area. You may choose to stay on the ferry and do the return journey. Either way, the views make a pretty picture showing off our beautiful harbour.